While working on my Rachael Ray Roundup lately, I've been seeing several folks trying out Rachael's recipe for Florentine Mac and Cheese and Roast Chicken Sausage Meatballs from her Just in Time. The recipe just doesn't sound that great, but for some reason, it was outstanding. This recipe is also pretty healthy, since the meatballs are baked not fried. 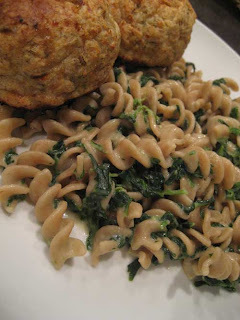 If you use whole wheat pasta, it will also help make the meal a bit more on the healthy side. I love a meal where the veggies are part of the meal, too. You could serve just the pasta and meatballs and would have a satisfying and fulfilling dinner. It is also easy to make in about 40 minutes, other than the fact that the water seems to take forever to boil. Defrost spinach in microwave 8 to 10 minutes on "defrost" setting depending on the microwave. Place the boxes in a shallow dish to catch any run off. i'll try to restrain myself from using profanity - which is a toughie for me - long enough to say that this is one of the few rachael ray dishes that looks appealing to me. i'm with you on liking with the veggies are integrated. the florentine mac & cheese sounds really good... I might be able to get my oldest to eat mac & cheese since it has spinach in it (I know that's a weird thing to say), and my youngest to eat spinach since it's IN the mac & cheese... yep, I have weird kids! Looks great!